The poster highlights important cultural and insect and disease management practices based on vine growth (phenological) stage. 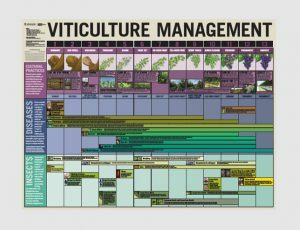 Management was based on growth stage as opposed to calendar date in an attempt to make the poster valid and useful in all vintages and in vineyards located across the southeastern US. If judiciously placed in the “shop”, this poster should serve as a good reminder of what to be scouting for and managing for throughout the growing season. Pesticides were not included on this poster due to the high frequency of chemistry and label changes, old pesticide outdating, and new pesticide introduction. Such changes would have immediately outdated this publication. Supplies are extremely limited due to the funds made available to print these posters on the chosen, high quality stock. These posters are first available at the Georgia Wine Producers Conference (February 5th at Chateau Elan in Braselton, GA; http://www.georgiawineproducers.org/2019-annual-meeting/), and are free to commercial vineyard owners/managers in Georgia, North Carolina, and Virginia. They will be made available for purchase at a later date for those that desire one but do not receive one before supplies run out and/or are not currently commercial growers in Georgia, North Carolina, or Virginia. Note that these posters are not applicable for muscadine growers as an effective seasonal management for muscadines is greatly different than that for bunch winegrapes, as seen in the bunch grape and muscadine IPM production guides at http://www.smallfruits.org/. Reach out to your statewide viticulture extension specialist (if outside of Georgia) or your local UGA ANR County Agent to inquire about how to receive one of these posters at a future workshop, conference, etc. We hope y’all find these useful. Posted in Bunch Grapes, Events, Pest management Guidelines. Bookmark the permalink.